Pakistan on Tuesday signed a Memorandum of Understanding with Alibaba Group Holdings Limited to promote Pakistan’s worldwide exports by Small and Medium Enterprises (SMEs) through e-commerce. Alibaba Group’s Executive Chairman, Jack Ma and Prime Minister Nawaz Sharif witnessed the signing ceremony. “I am glad my meeting with Jack Ma at the World Economic Forum in January has come to fruition in the shape of the MoU we have just signed,” the premier said. 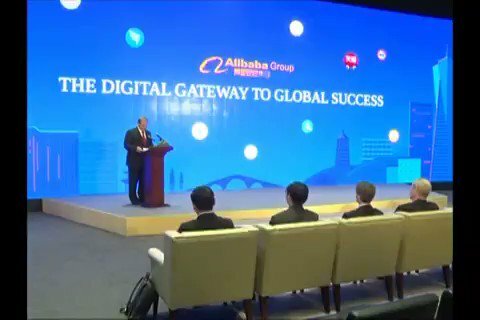 “My appreciation of Ma’s dynamism and performance of [the Alibaba] group comes not only from its success as a e-commerce giant but more so from the focus of the group on job creation and livelihood generation,” he added. “E-commerce is a powerful tool to stimulate economic activity, effort, innovation and entrepreneurship across all sectors of the economy,” the prime minister added. “When Jack Ma shared with me his interest in establishing an e-platform in Pakistan, i instructed my office to facilitate Alibaba’s initiative in every manner and in the shortest possilbe time frame,” he the prime minister said, adding that the MoU had been signed within four months of when the initiative was first conceived. Online and offline training programs for the SMEs would also be conducted by Alibaba in a bid to assist SMEs with on-boarding on to Alibaba’s platforms and optimizing exports through e-commerce. The Alibaba group has in recent years been aggressively courting foreign brands to set up Tmall stores to sell to China’s vast and growing middle class by offering to smoothen out Chinese sales, payment and shipping processes. Ma, a Chinese citizen, appears frequently with leaders from the highest echelons of the Communist Party, and both sides have voiced their support and admiration for each other. Alibaba has deep ties with the Chinese government, working closely on some of the country’s core technology development goals including cloud infrastructure and big data. Be the first to comment on "Pakistan on Tuesday signed a Memorandum of Understanding with Alibaba"